Polish rabbi and anti-Shabbethaian of the eighteenth century; rabbi of Tarly. He was very prominent in persecuting the Shabbethaians who had established themselves in Podolia, and on this subject he corresponded with Jacob Emden in 1759 and 1760. In the quarrel between Jacob Emden and Jonathan Eybeschütk, Zamosz, as is evident from his letters reproduced in Emden's "Shoṭ la-Sus," sided with Emden. 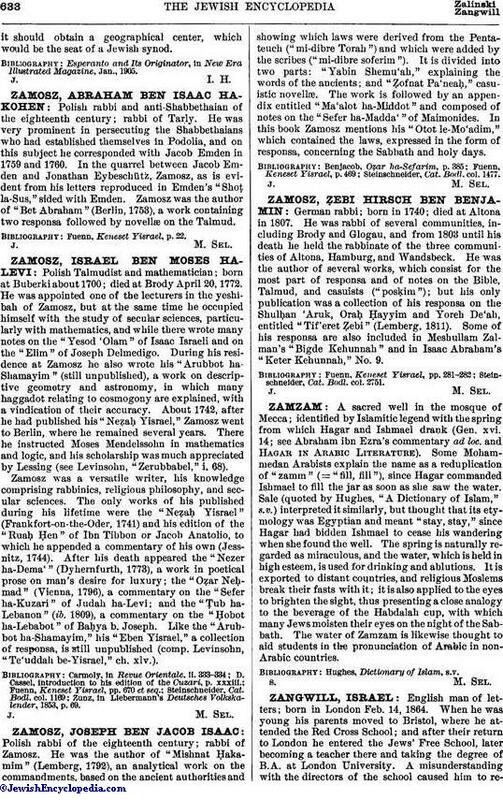 Zamosz was the author of "Bet Abraham" (Berlin, 1753), a work containing two responsa followed by novellæ on the Talmud. Fuenn, Keneset Yisrael, p. 22.